Established in 1984, Lincolnshire wine merchants Jeremy and Rachel Marshall-Roberts wanted to add to the prestigious and fine wine they were selling and create gift sets – enter Hay Hampers. After 30 years they left the company but were keen to ensure their close-knit family ethos remained. Luckily, eager to enter the entrepreneur life was Italian couple Elisabeth Och and her husband Gabriele Da Re. Ready to spend more time together and with a passion for food and wine, Hay Hampers was the perfect match. Taking over in 2014, they have used their backgrounds in the financial and marketing industries to promote Hay Hampers in the competitive gourmet market and its turnover has more than tripled in the past four years. The pair have remained true to the traditions of the company, even the majority of the employees remain from before they came to own the Bourne premises. The Marshall-Roberts themselves even work part-time as wine educators and consultants. As a Small Business the company faces challenges in competing with the larger retailers who are also in the food and wine gifts business. “There are many challenges, even as simple as our promotion on Google. The big businesses will always come up on the first page, whereas we struggle to do this,” says Elisabeth. 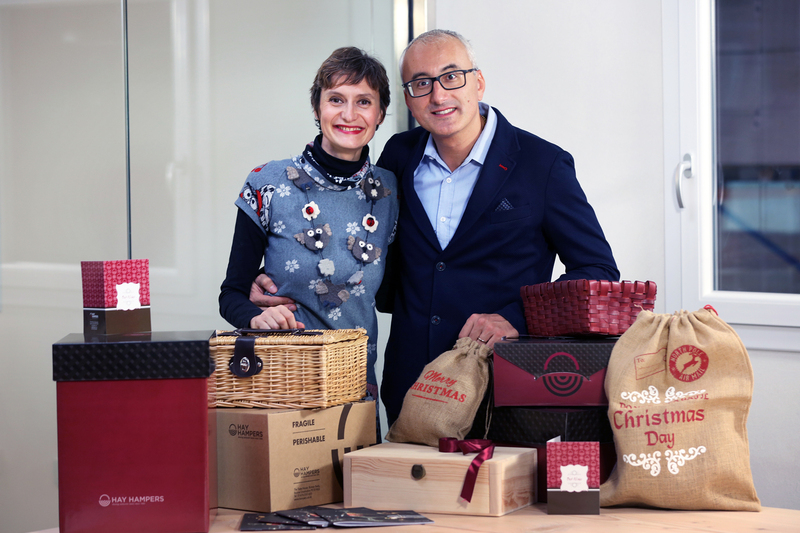 To gain the upper hand, Elisabeth and Gabriele have placed more focus on community engagement, including supporting local charities by providing hampers as prizes at events. Elisabeth also places a lot of emphasis on the importance of sustaining the local community. She and her husband always try to find local food artisans and help them become their suppliers. For example, if they don’t have the suitable packaging, Hay Hampers will help them to design and source.